As Quality Solutions Director at General Plastics, Tod Maurmann oversees its FAA-approved testing facilities and works with customer engineers to identify design, material and testing solutions in support of their projects. The 25-year veteran of the industrial technology industry is our go-to expert on physical property and flammability testing, with the latter particularly critical in the aerospace, defense, space and nuclear industries. Here, he offers insight on GP’s flammability testing facilities, capabilities and processes, and how they benefit customers. Q. What types of flammability tests does General Plastics’ offer? A. We offer FAA-approved Bunsen burner tests, seat cushion oil burner testing and insulation flame propagation testing. In 2015, we received FAA approval of our smoke density and heat release testing. (Read detailed descriptions of available flammability tests). FAA Bunsen Burner –FAR 25.853 APP.F, Part I. Seat Cushion Oil Burner Test –FAR 25.853 APP.F, Part II. Heat Release –FAR 25.853 App.F, Part IV. Q. What flammability testing equipment does General Plastics have? A: We have two Bunsen burners, and a Park oil burner for seat cushion testing. 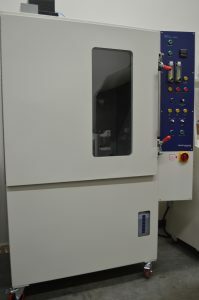 For smoke density and heat release tests, we have the Marlin Engineering ME 1100-1 Smoke Density Chamber and the ME 1200-1 Heat Release Chamber. Q. What are typical turnaround times for flammability testing and how do they compare to other testing facilities? A. Unless it’s a long-term test, we typically get the test completed and results out within one week of receiving the specimens. Our customers tell us the wait is anywhere from two weeks or even longer to get results from other testing facilities. Q. How much notice is needed to schedule testing? A. We’re known for flexibility in helping customers meet their required timeframes. For example, many customers may not know specifically when they’ll have seat specimens ready for their oil burner tests, but we maintain good availability so we can respond quickly once the customer is ready. And we get cushions from customers around the world. If a customer asks, ‘What’s your availability in September,’ we can give them some options, but it’s best to know as early as possible to confirm a specific date for them. If they give us a target date, we can almost always fit them in right when they need to be. We understand that it may often be on short notice. Q. Are customers welcome to witness tests at your facility? A. Absolutely – Any customer who is having a product tested is welcome. In fact, especially if it’s R&D work, we encourage customers to come and watch the test and see how the product performs. They can take pictures; they can shoot video as it pertains to their specific test – they own the materials. We’ve had customers fly halfway around the world to witness tests and we have those who drive 60 miles. Especially with flammability, it’s important for the engineers to understand how their material performed during the test. There are different modes of failure for any of these tests, so it’s important to see that. Q. Can you provide test witnesses in conjunction with testing? A. Our services include coordinating with test witnesses and supplying all required FAR burn testing reports and documentation. We also provide pre-testservices prior to FAA witnessing. Q. If someone is interested in having a product or some material tested, but hasn’t worked with General Plastics’ testing services before, what do they need to know? A. It speeds the process if we know upfront the type of material they want tested, the application of the material, and perhaps the performance characteristics they’re looking for. And, do they have a specific test method already in mind? We may need to get more details to address their request or work up a quote. They also should know that we will respond to their inquiry right away, whether it’s “Yes, we can do it on these dates” or to ask additional questions. Q. What if the customer doesn’t know which is the right test method or what they want tested? A. We offer recommendations, guidance and ask questions about their material that will help define the scope of the testing. Q. What if it’s a project that’s somewhat unique or that doesn’t have set guidelines? A. Some tests are cut and dried – you simply follow the defined test method. In other cases, we develop a plan to run some tests that are pertinent to the customer’s product. For example, we are currently working with a customer who sent us several materials for testing. We put together and proposed a test plan to them, but rather than run through the entire test order, we told them we would run the first series of tests on the first material. We didn’t want to give them a raft of test reports and then find out it’s not exactly what they wanted because the setup was unique for their process. So, we ran the first material and gave them the full data. We then asked for feedback to confirm it was indeed the information they expected and wanted to see, and that it was provided the way they wanted to present it. We worked through the details, and when they were happy with it and confirmed it was what they wanted, they gave us the go-ahead and we proceeded with the rest of the tests. This approach minimizes our customers’ risk as well as ours. We don’t want to run through a project like that only to find out it’s not what the customer wanted. Q. What if a customer isn’t sure how to interpret their results? A. Flammability involves a pretty consistent battery of tests and the results are what the results are. From a testing perspective, we’re just reporting the results, but sometimes there are things that we see or that we think are worth mentioning. If we see a failure, we may try to provide some insight into why the product didn’t perform in the way they expected or hoped it would. Q. It sounds like there’s a lot of communication back and forth. A. Yes, and many customers comment that we’re really good at communicating with them and keeping them apprised of progress. We let them know that their specimens have arrived and where they are in the process, such as sample prep or in conditioning. We try to keep customers updated on their test status as much as possible. Q. What accreditations does the facility have? A. General Plastics’ FAA-certified Burn Test Facility conducts tests in accordance with FAA, ASTM and other customer methods and requirements. In fact, General Plastics’ burn-test facility is one of only nine in the nation listed in the FAA Handbook Appendix F for the seat oil burner test. Our facility and flammability test protocols were approved by the FAA in 2010, based on the quality of our setup procedures, specimen preparation, equipment calibration, sample burn performance, data collection and results reporting. In 2015, FAA certification was extended to our OSU (Heat Release) and NBS Smoke Density testing equipment and operations. Our facility is also AS9100 and ISO-9001 accredited. Q. Do you only offer testing for customers in the aerospace industry? A: A lot of our flammability tests are related to aerospace requirements, but there is definitely some crossover between industries when it comes to flammability testing. At times, there are similarities in requirements for aerospace and other types of commercial applications where one test is essentially a modified version of another test. Contact us for questions on your testing requirements.